It usually takes tons of time for the customers to contact Dominion to resolve their problems due to the waiting time on a phone line or the responding time. Therefore, we thought of creating a mobile app that allowed the customers to solve their problems directly on their smartphones, which were available immediately. 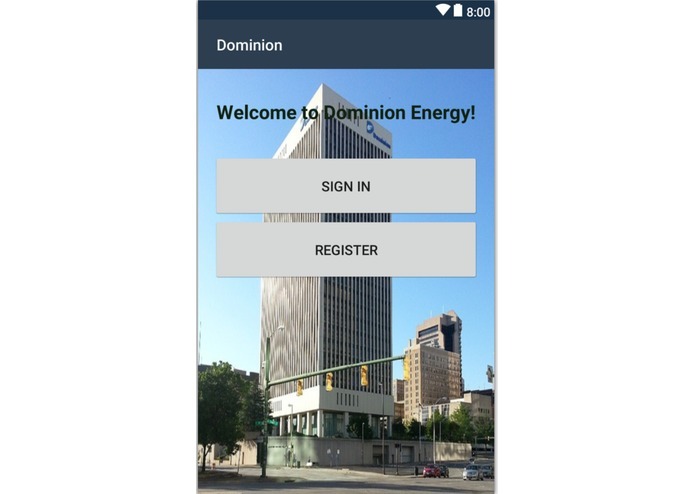 The app allows a user to interact with Dominion. The customer then can get access to his/her electric bill; make a payment; view monthly usage; access services of Dominion like starting a new service, transferring service, reconnecting service, adding additional service, and temporary disconnecting; and manage his/her account. The customer can also search for a specific service/problem. The app tends to link to the customers' database of Dominion and recognize if the customer is a valid user. At the initial stage, we design the very first user interface with C# by Microsoft Visual Studio. The front end of the app is designed by the axml layouts and the backend is going to be designed by C#. We created xml files to create styles for the buttons in axml files. The search function is built so that the customers can find their desired problems with some certain keywords, then the "search" function is going to search the entire app's data to give the users' hints. We could not create the backend and not successfully execute the app on a virtual machine or a real mobile yet. Besides, our interface needed to be re-design for aesthetic reasons. There are two accomplishments that we're proud of, which are our ideas and our code skeleton. We have learned that innovation is essential to any problem solving and thus, we have been looked for a solution that most customers were looking for, and thus, we thought of the ideas that allow the customers to keep track of their spending and usage to aid them to manage their budget, to claim damage immediately to Dominion, which is with less time than calling and waiting on a line, and to generate a program that allows the users to collect reward points. Though our program's code skeleton is not fully executed yet, we managed to draw a concrete picture of how different frontend and backend classes would work and corporate to each other. "Innovate or wither away" Thomas F. Farrell We learned that finding a new way to solve a problem is as important as creating a new program, which encourages the customers to continue using the services. We also learned to programme with C# and .NET from Microsoft Visual Studio. The app is going to be developed into a full version with clickable buttons and properly functions. It is going to be assigned with additional functions to collect customers' feedbacks and return them to the company. I designed the app's skeleton and wrote the code. I generated the ideas of the apps and detailed information.